Perry Auto Group: 1st Annual Power Event at Perry Auto Group! 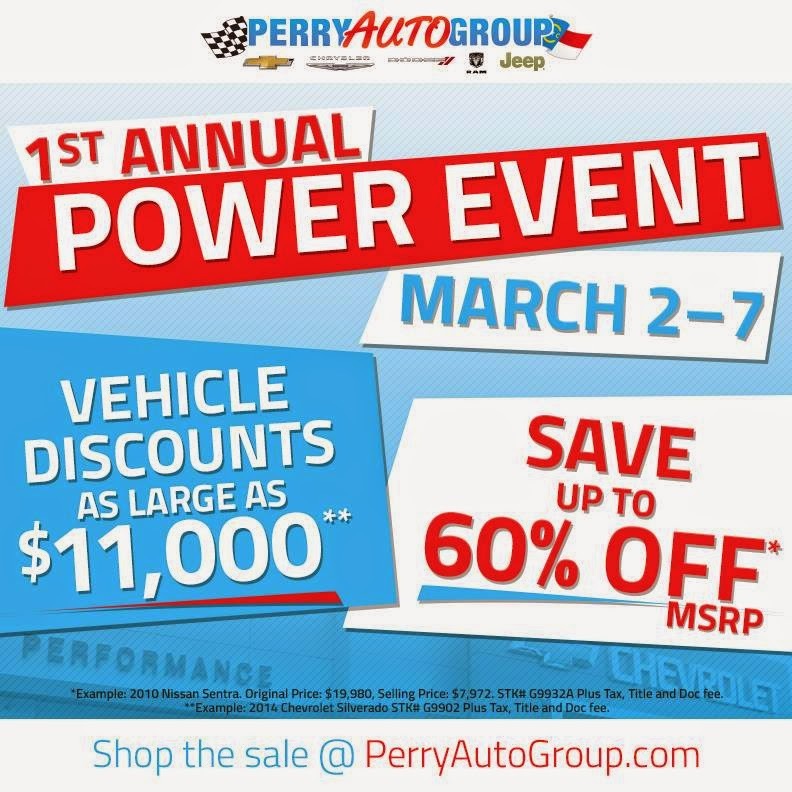 ELIZABETH CITY, NC - Now through Saturday, March 7th is the 1st Annual Power Event at Perry Auto Group! We wanted to kick off the month of March in a BIG way and what better way to do that than offer our customers HUGE savings on some of their favorite vehicles? You can start shopping right now by viewing our online inventory! During the 1st Annual Power Event at Perry Auto Group, we are offering vehicle discounts as large as $11,000 and savings up to 60% off MSRP! From a 2014 Chevrolet Impala LT to a 2014 Jeep Cherokee Sport, we have great deals on a variety of vehicles that will surely suit ANY driver's needs. At Perry Auto Group, we serve as your dealership outlet for a massive selection of Chevrolet, Chrysler, Dodge, Jeep, and Ram vehicles. You can count on the Perry Auto Group team to offer you the best service to help you find the perfect car, truck, SUV, or crossover.